This post is about unkempt orchards, cherries, and Angélique. It is also about a need for solace, knitting and the colour apricot. I am a little tearful as I write this post though happy too. Life is beautiful but there are also testing times when, in our case, learning the art of patience is almost too hard to bear. Mickaël and I are awaiting the final (we hope) verdict of one of two long-drawn-out legal battles which should come in the early days of July; a painful case of unfair dismissal which occured shortly after Angélique was born. Thanks to his splendid determination and sunny outlook I have witnessed my husband making great advances in a new professional sphere and I am so very proud of him. We strive onwards and upwards in our own small ways every day. We both take enormous pleasure in our three children and relish their passions and achievements. From time to time however frustration seeps into our hearts and makes them a little heavy although for the most part we bear the discomfort quietly. I gain solace from many things; dreaming up my linen rabbits (or hares as many prefer to call them) is the first thing which springs to mind. I also need to be outside. For Mother's Day a couple of weeks ago I had the great joy of receiving a beautiful bicycle and I take it out to the vineyards whenever possible with my knitting bag slung in the basket and breathe quietly and freely. I have found that knitting grounds me perfectly too. The excitement of choosing a pattern, mulling over colours and yarns but mostly the simple fact that I am in control of the garment I am constructing. If I stumble across a mistake I give a little sigh and frog it knowing that I alone can undo, redo and complete the project. There is no sense of helplessness. This is a very heartening thought indeed and much better than coming unravelled myself. I would like to share with you, if I may, some of the many pockets of pure joy savoured during the past week. Angélique and I have walked to this orchard several times this week. There are cherry trees, pear, plum, peach, and fig trees growing alongside the vineyards. It is a heavenly spot. We have the good fortune of being able to pick cherries by the handful. Today we forgot our basket and ended up using a pair of boots to hoard our treasure. 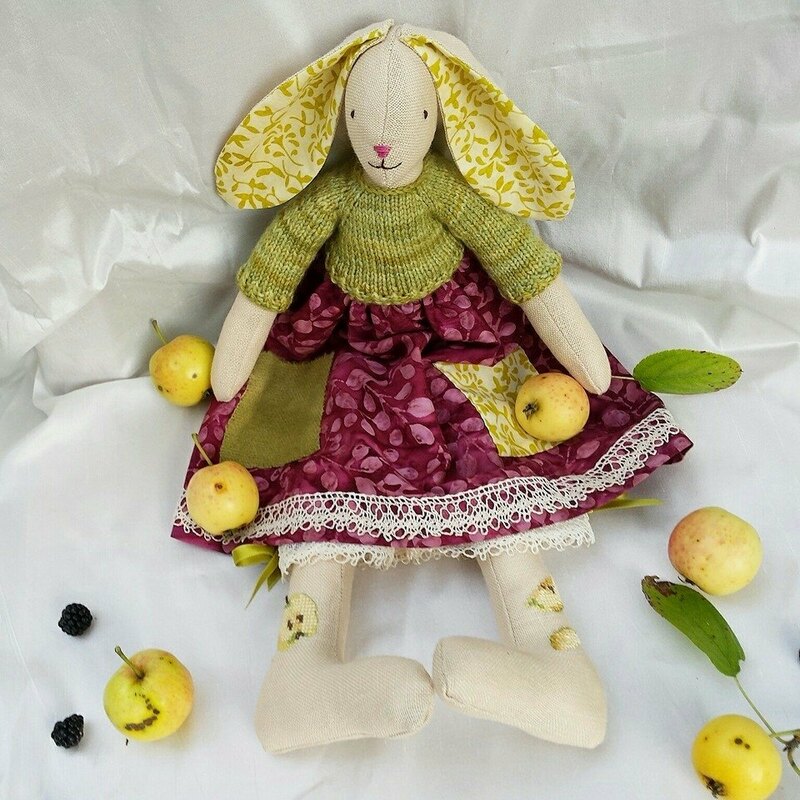 There has been some solace knitting in between stitching my beloved rabbits/hares. Whilst orange is not my favourite colour apricots are my favourite fruit. This is the time of year when we indulge in kilos of peaches - the French always scoff at my preference for yellow over white peaches with their more delicate flavour - melon, and apricots. I always add a vanilla pod cut lengthways when preparing a batch of apricot jam. I decided to buy my first Quince & Co. Lark yarn in Apricot. Kelly Herdrich's "In Threes" pattern, as you can see, is a v-e-r-y simple pattern indeed. before starting a more challenging knitting project next week. Details are on Ravelry, of course and I will be slipping this little number into my 12 Sweaters In 2012 challenge. That makes it six in total so far I believe. I have lingered beside these apricot-coloured roses on my way to and from my children's school. I am looking forward to visiting the International Garden Festival at Chaumont sur Loire very soon whilst reliving some memories of last year's which was on the theme of "Future Gardens" - Jardins de l'Avenir. Le Jardin de Madame Irma was one of my favourites. Madame Irma is a fortune teller which makes her's a garden of the future, naturally! And, as you know, I love gypsy caravans although I'm pretty sure our future one will not look similar to this one. It's wonderful to dream although putting our dreams into reality is much more satisfying, don't you think? And it's apricot coloured, right? There are so many delights surrounding us all. Which things have been giving YOU joy this week? I'm off to give my children a hug and to make more rabbits. I'll be back with an update on those creatures soon. Today I have the honour of joining Anita's Parisian Party at Castles, Crowns and Cottages although I am a little fashionably late in arriving as it officially started yesterday! I love Paris. It must be in my blood. My mother was born in Paris and told me tales of her grand-parents' appartment overlooking the gardens of Versailles. I have inherited an uncanny fondness for the smell of the Parisian metro from my aunt who lives with my uncle opposite the Sorbonne and who still continues to catch a whiff of the fetid metro air with relish at the grand age of eighty three. The years spent in Paris were the happiest of my life and I believe that my decision to write a thesis on seventeenth-century Parisian gardens and theatre aesthetics was based on a need to return to the capital regularly. 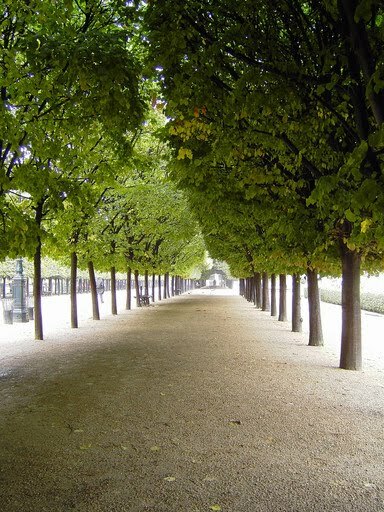 Every day on my way to work I would walk through the lime tree lined avenues of the Palais Royal gardens. The sweet fragrance of those flower-laden trees was intoxicating in spring. Aren't those linear alleys with their regularly planted trees quintessentially French? 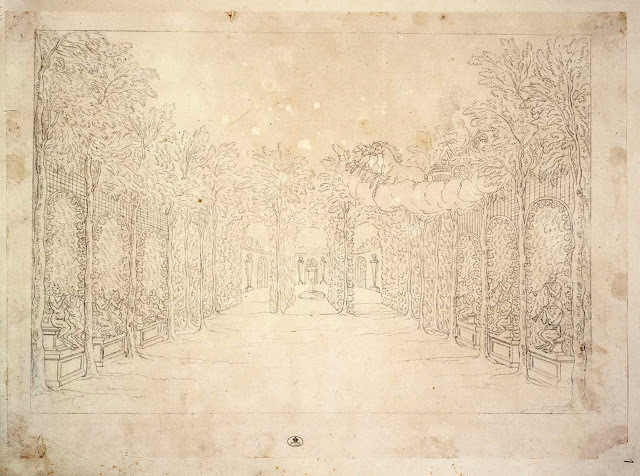 In eighteenth-century theatre design gardens were much favoured and often associated with architecture. 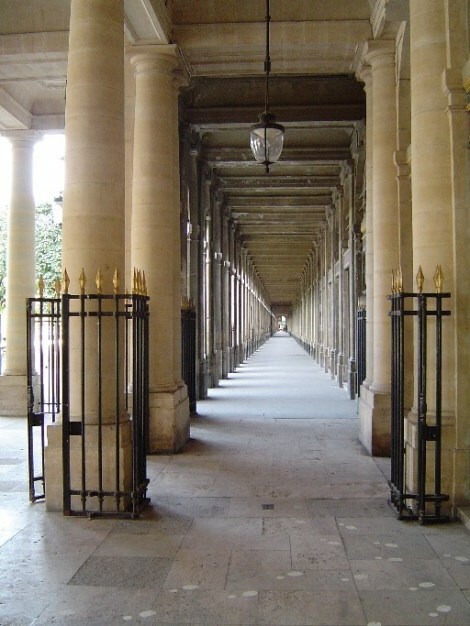 The picture below, taken from the Palais Royal galéries, could very well be the backdrop to an opera or ballet. A darling and provoking perroquet. That her eye smiles, musing among it folds. The slightly simpering sparkle of the eye. This picture is taken from Le Poème Harmonique's website. 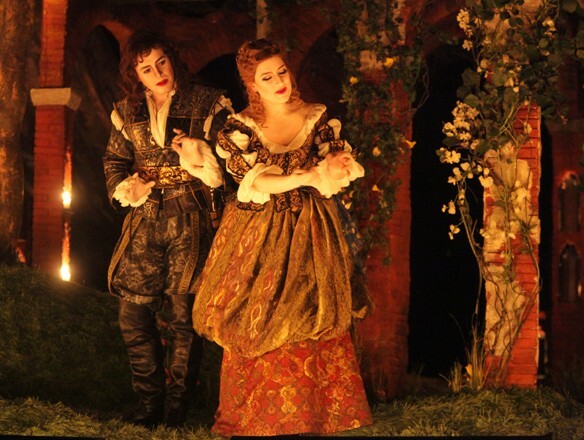 Take a peek as their Baroque operas and plays are truly exquisite; completely candlelit! I have drawn inspiration from garden avenues, rows upon rows of leafy trees, and the colours of Baroque opera. Who could not? The rows and alleys here are our neighbouring vineyards in Vouvray as we could not make it to Paris; sorry Anita! The colours are reminiscent of my favourite opera, Cadmus et Hermione, Jean-Baptise Lully's first opera to be performed in Paris in 1673 and much favoured by Louis XIV. The DVD of this work is A WORK OF ART! The pattern I have knitted is Scalene. 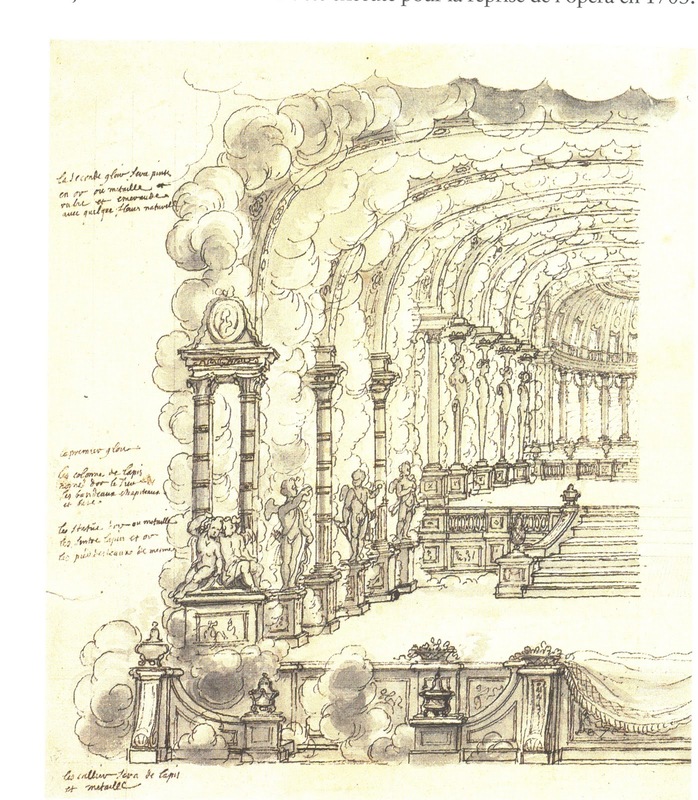 It's asymmetrical composition is a perfect definition of the word baroque which derives from the Portuguese word denoting an irregular pearl. The yarn is Madelinetosh DK in Fragrance and Olivia. The model is Héloïse, of course, who will be performing on stage tonight a ballet named Promenade à Paris. Thank you so much Anita for inviting me to your Parisian Party. There is a meandering, narrow road in our village whose name lends itself to flights of fancy and is pretty difficult to pin down in English. Does it refer to the picturesque glimpses of the Loire river which runs below through the lush foliage or to the radiant countenance of a mysterious face? Who can tell. On our stroll along the rue de Beauregard this morning the air was vibrant with the shrill song of a band of crickets while countless birds seemed to be auditioning for their singing jobs. This lane, where dreams abound, has a timeless quality. Tucked away behind those lofty stone walls are beautiful properties which most of us can indeed only dream of possessing. One cannot help peering through firmly closed gates to catch a glimpse of another world. Many buildings on our north bank of the Loire river are partly constructed from a soft chalk rock called tuffeau which has been quarried since the eleventh century. Safe from past attack and insulated from extremes of hot or cold these troglodytes or caves, carved out of the hillside, represent a network of more than a thousand kilometres. There were dwellings for peasants and also manor houses with extensive cellars where wines were stored. If you look at a wall up close you will see nuggets of caramel-coloured stone, faint brown streaks and, perhaps, an oyster shell; a fossil left from the sea that once covered that part of France. On entering such a house there is usually a musty smell but, more importantly, a silence and introspection which give the impression of ancient things lying dormant. Stone steps, high turret windows, and Pierre Ronsard roses - named after our local sixteenth-century poet - complete the picture. Yesterday evening the ambiance here was quite different. Our children's school had organised an exhibition of their artwork both inside the dim honeycombed tuffeau rooms and outside in the dazzling early evening light. Children flitted about. There was much merrymaking. Vouvray sparkling wine flowed and tasty food had been lovingly prepared. It was such a memorable occassion we simply had to return this morning just to have another look. This time the gates were closed and this house, like others in the rue de Beauregard, was slumbering once again. Roses blooming like a meteor shower had rearranged their blankets of colour for the day. If lingering a while you would see rose petals falling in slow motion and soft as rain. They litter the pavements with bright paint flakes. Perhaps one might find a spindle and spinning wheel with silken thread in this turret room? a shawl made of silk, alpaca, and merino. A gift made for my mother and not for Sleeping Beauty! For those who feel they are experiencing a little déjà vu this a replica of my Cosette Wrap knitted last winter this time knitted up with opulent Juno Pearl in Flight and French Grey colourways. I wanted to give my mother a corner of blue sky with a silver lining. Both the pictures above were taken at the Chaumont International Garden Festival last year. There will be more on that soon. Details are on Ravelry of course. Thank you so much for your warmhearted comments on my previous post. You are all wonderful and I am very grateful for the network of inspiring, clever, and kind people out there. My next post will cover in part my embroidery workshop with Cécile Franconie at Loop in London. Needless to say an amazing time was had by all. I would also like to wish a very happy Jubilee to everyone in the UK. Today is Mother's Day in France!